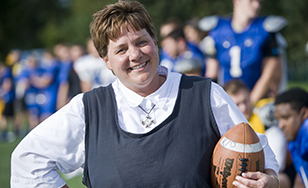 St. Scholastica assistant football coach Sister Lisa Maurer will give a talk called "Tackling Life With Joy" at St. Scholastica Monastery, 1100 Kenwood Ave. Her presentation, which is free and open to the public, is at 10:45 a.m. Saturday, Aug. 25. The St. Scholastica football team has its first-of-the-season joint practice with another team at 1 p.m. the same day. Sister Lisa is a Catholic Benedictine nun at St. Scholastica Monastery. Her responsibilities also include Campus Ministry work at The College of St. Scholastica. In "Tackling Life With Joy," Sister Lisa will share stories of her life as a coach and as a Benedictine Sister. "In football you have a big playbook," Sister Lisa said. "There are lots of plays but really they're all based on a few things - you can run, or you can pass, or you can hand off. I'm going to talk about having four plays for a good life - hospitality, stewardship, respect, and justice. Those four plays you can run all day, every day of your life. At work, at school, at home, if we're intentional about living those things, they can help us tackle whatever comes our way with joy. I believe that if you live your life in values, that's a joyful life." Sister Lisa's role as a football coach has drawn the attention of people across the country. Her story has appeared in the New York Times as well as on the national CBS Evening News and FOX News, on ESPN Radio and National Public Radio, and in the Minneapolis Star Tribune. The public is also welcome to join her and the other Sisters of St. Scholastica Monastery at morning prayers at 10 a.m. in Our Lady Queen of Peace Chapel.